NEWARK, N.J. -- Three former allies of Gov. Chris Christie were charged Friday in the George Washington Bridge traffic jam scandal that has cast a long shadow over Christie's White House prospects, and one of them pleaded guilty. Christie himself was not publicly implicated. 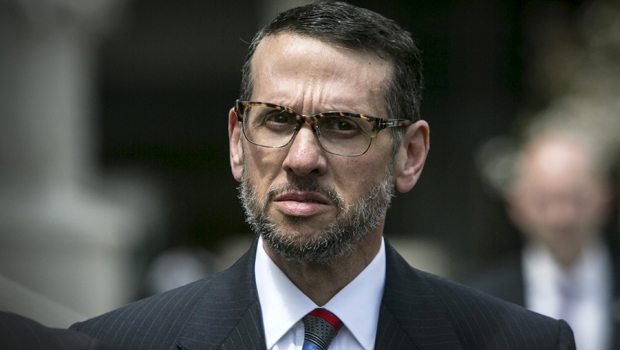 David Wildstein, an official at the Port Authority of New York and New Jersey at the time of the tie-ups, pleaded guilty to federal conspiracy charges and could face about two years in prison at sentencing Aug. 6. In court, he said he and two other Christie loyalists closed lanes and engineered the traffic jams in September 2013 as political payback against a Democratic mayor, then concocted a cover story: They claimed it was all part of a traffic study. The two people he implicated - former Christie deputy chief of staff Bridget Kelly and Bill Baroni, who was the governor's top appointee at the Port Authority - were charged in an indictment unsealed later in the day. Wildstein gave no indication in court that Christie had any role in the scheme. But after the hearing, his lawyer, Alan Zegas, reiterated a claim he made last year that there's evidence that Christie knew about it as it happened. The Republican governor has insisted all along that he knew nothing about the plot. Lawyers for Kelly and Baroni planned afternoon news conferences to discuss the charges. The nine-count indictment accuses Kelly and Baroni of conspiracy, fraud, deprivation of civil rights and other charges. The scandal broke wide open more than a year ago when an email from Kelly to Wildstein was revealed. It read, "Time for some traffic problems in Fort Lee." Wildstein's reply: "Got it." That exchange was key in the indictment. The closing of two of three access lanes caused monumental gridlock at the George Washington Bridge, one of the busiest spans in the nation, linking New Jersey with New York City. School buses and emergency vehicles were held up, and commuters were stuck in traffic for hours over four mornings. Wildstein said they orchestrated the lane closings to start on the first day of school to punish the mayor of Fort Lee, a town at the foot of the bridge, for not endorsing Christie's re-election bid. Christie, who coasted to re-election in the fall of 2013, has called the scheme "stupid" and ridiculed the notion that he was even interested in an endorsement from Fort Lee Mayor Mark Sokolich. Before Wildstein appeared in court, Christie declined to comment Friday as he left a hotel in McLean, Virginia. But on Wednesday, when asked about impending action in the case, he brushed off the potential impact. "I don't think that has anything much to do with me," he said. Federal prosecutors scheduled an early afternoon news conference on the case. By the time the incriminating email was made public, Wildstein had resigned, as had Baroni. The governor soon after fired Kelly and cut ties with Bill Stepien, his two-time campaign manager. Stepien was not indicted. Questions over whether the lanes were closed for political retribution have been dogging Christie for more than a year. Christie has been gearing up for a 2016 presidential campaign but has not announced he is running.